Every now and then a manuscript comes across an editor’s desk that makes one sit up and take notice. It is a rare privilege to be pulled into a story by the sheer power of its narrative. A gift even more exceptional is when the reader feels the earth beneath their feet and smells the wind through the pines. Such is the case when reading The Legend of Tyoga Weathersby. Peppered with historical facts from the founding of Jamestown to the massacre at Wolstenholmstown in 1622, this fast-paced read takes the time to bring the Appalachian Mountains of the late 1600’s alive in exquisite detail. From the description of the Weathersby’s rescue of the powerful Powhatan chief, Opencanecanough, to the ferocious battle on the escarpment between Tyoga and the commander of the wolves, this captivating tale keeps the adventure reader turning the page, and the lovers of romance wanting more. Set at the turn of the 17th Century in the frontier of Appalachia, The Legend of Tyoga Weathersby follows the adventures of a young settler and the Native American tribe that has adopted him as their own, as he is transformed by deed and circumstance to legendary stature. Mystically awakened to the promise of “knowing” as generations of Weathersbys before, the rhythms of the natural world unfold in mysterious ways as he is embraced by primal forces that seem beyond his control. Tyoga is tested by the might and savage fury of the leader of a marauding pack of wolves, and in saving the life of his companion Tes Qua Ta Wa (the One Who Opens the Door) his life is transformed and the legend is born. As the lines between man and myth, spirit dog and mortal soul begin to blur, Tyoga Weathersby is embroiled in the intrigue of intertribal politics, captured by the cry of the wild to fulfill destiny’s call, and ripped apart by his love for the beautiful Cherokee maiden, Sunlei, whom he must set free to keep alive. The Legend of Tyoga Weathersby is so much more than a captivating story. It is a “must read” for everyone who has ever questioned the whim of fate, and the power of destiny. H.L. 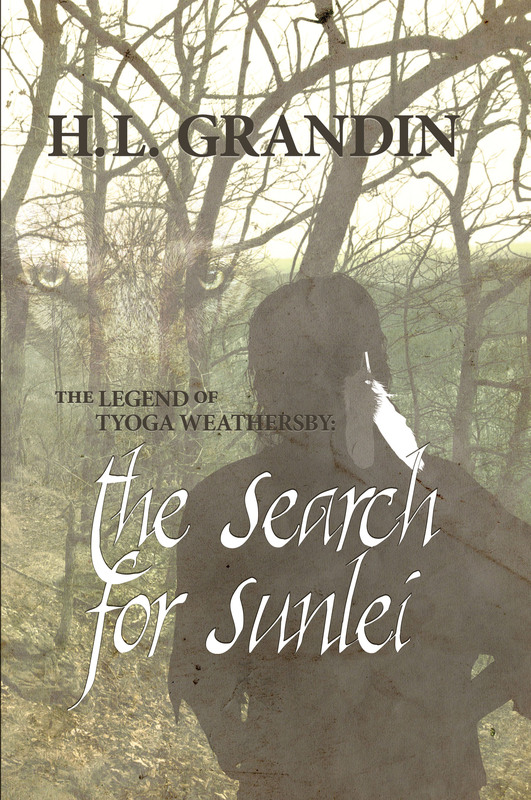 Grandin’s second installment in The Legend of Tyoga Weathersby series, The Search for Sunlei, will be released May 1. This exciting sequel to Grandin’s debut novel brings the reader closer to the intertribal tensions and international rivalries that permeated the American frontier directly before the French and Indian War and, against that backdrop, brings into stark relief Tyoga Weathersby’s struggle to thwart the inner demons that battle for his very soul. H.L. Grandin grew up in Virginia and along the way developed a deep appreciation and respect for nature, as well as a yearning to know the heritage of the land and of those who walked it so long ago. Educated in Virginia and France, H.L. has spent his career in healthcare, with a stint as proprietor/owner of a coffee and blues bar. He is a self-taught musician and was drummer for several bands throughout high school and college. He currently entertains his wife and dog with his 12 string guitar. For the last twenty-five years, H.L. has lived on a small farm in western Maryland where he and his wife raised three daughters and a passel of critters. A natural storyteller and prolific writer, H.L. has been quietly composing a cast of characters and their adventures for at least ten years. About three years ago, he seriously put pen to paper and The Legend of Tyoga Weathersby was born. This is Harry Grandin’s second novel in The Legend of Tyoga Weathersby series. The third novel, Huntly House is about Tyoga and Trinity Jane’s daughter, Rebecca Jane, and how she and her father changed the course of history. He is also writing a book of short stories. To learn more about The Legend of Tyoga Weathersby and H.L.’s future books, please visit tyogaweathersby.com. Released July 19, The Murders at Astaire Castle is the latest Mac Faraday Mystery. Fans of the Mac Faraday Mysteries beware! This one comes with a special Halloween twist! The Murders at Astaire Castle is the fifth Mac Faraday Mystery in the series. Fans of the Mac Faraday Mysteries may notice a slight difference in The Murders at Astaire Castle. While this mystery does contain some supernatural elements, I would not classify it as a paranormal. Halloween has always been a fun time. It is the time to break out and be someone else. As a child, I would pretend to be one of the Bobbsey Twins searching for clues to lead me to a secret treasure. If I was lucky, it was made up of chocolate. As a teenager, I was Nancy Drew. Always, when October rolled around, I craved mysteries with something extra added—something beyond the normal—something supernatural. As an author, I couldn’t resist taking this one Mac Faraday Mystery on a scary Halloween adventure. I hope you enjoy this ride as much as I enjoyed writing it. For you, my dear readers, The Murders at Astaire Castle is my Halloween trick or treat goodie to you! Enjoy! Lauren Carr is the best-selling mystery author of the Mac Faraday Mysteries and Lovers in Crime Mysteries. Based on book sales for her mysteries and anthologies, Amazon regularly lists her among their top one-hundred mystery authors in both ebook and print. The owner of Acorn Book Services, Lauren is also a publisher. This year, thirteen titles written by independent authors (not counting Lauren’s own titles) will be released through the management of Acorn Book Services. Released September 2012, Dead on Ice introduced a new series entitled Lovers in Crime, which features prosecutor Joshua Thornton with homicide detective Cameron Gates. The second installment in the Lovers in Crime series, Real Murder, will be out in January, 2014. Today’s guest post is by H.L. Grandin, the author of the wonderfully epic The Legend of Tyoga Weathersby. Many readers have asked me about the notion in the book that has to do with nature’s grand “plan” and the part that we play in determining how that plan unfolds in our own lives. There are several scenes in the book where Tyoga seems to accept the judgment of nature’s way, placing his fate in his closely held belief that all events unfold in accordance with the grand plan. That plan decrees that all things happen for a purpose and to question outcomes is an exercise in futility. Tyoga is introduced to this notion by his father, Thomas, just after his “awakening” on Carter’s Rock. His father says to him, “All things happen only as they must.” The meaning of his father’s words becomes apparent after his encounter with the Runion wolves on the escarpment. He defeats the alpha male, chooses to spare the wolf’s life, and finds himself alone in the woods with his severely injured Cherokee brother, Tes Qua Ta Wa. The choices that he must make in the moments after the battle, hold the life of his friend in the balance. And here is where the discussion really begins. If Tyoga is indeed making “choices,” to what degree is that choice influenced by situation and circumstance, and, if “free will” is part of the equation at all, to what extent is the outcome determined by the exercise of that uniquely human trait? Volumes have been written throughout the ages and the topic has been examined by some of the greatest minds the world has ever known. So here is my answer, “I don’t know.” But here is what I think: When the layers upon layers of excuse, explanation, mitigation, fabrication and apology are striped away from any given event – we are left with absolutes. Absolutes cannot be measured by subjective metric such as value and worth. Both are human constructs that have no relevance upon outcome. The absolutes are, for example: life or death, left or right, up or down. The test of whether a notion is an absolute is if it passes the either/or check. One cannot proceed “sort of” left or “kind of” right. In the final analysis, you have gone either left or right. The only other option is straight ahead. One cannot move “a little bit” up, or a “tiny scootch” down. In the final analysis, you have either moved up, or down, or not at all. You get the point. Examples of how events unfold “exactly as they must for no other outcome could possibly be,” occur to all of us every single day of our lives. A common example is when you arrive at an intersection at exactly the same instant as another car. Every single second of your life – up to that very moment – conspired to make that co-incidence arrival occur in exactly that way. If every single aspect and moment of your life is taken into consideration and accounted for – no other outcome could have arisen other than meeting that car at exactly that time and in that exact space. And there truly is no end to the chain of events that one could consider when examining the co-incident arrival. Considering only the immediate chain of events, i.e. if you had gotten out of bed one second earlier that morning . . . if you had take three seconds longer in the shower . . . if you had scraped your windshield a little less or a little more…. you would not have arrived at the intersection at the same time as the other car. But how about going even farther back in time? If you hadn’t purchased your current home . . . if you had taken five extra minutes picking out a pair of shoes in 1998 . . . if your visit to the dentist in the spring of 2001 had taken ten seconds longer . . . and on and on and on – you would not have arrived at the intersection at the same moment as the other car. Analyzing the exercise of free will takes a parallel track. We all acknowledge that we have indeed been endowed with the ability to exercise free will. But the influence that it has on the majority of occasions in our life is – I think – negligible at best – especially if one subscribes to the positions espoused above. If the purchase of shoes in 1998 influenced the arrival time at the intersection in 2013, then what portion of the co-incidental arrival was impacted by the choice of shoes? Most would agree that the choice of shoes was an exercise of free will. Many would agree that the time that it took you make the choice was not. Time is an absolute. It took the amount of time it took to choose the pair of shoes– and no variable of that time interval can possibly be. So if the impact of free will could be measured at all, I contend that the degree to which it influences events – especially when a free will choice is removed from occurrence by time – is infinitesimally small. So while it is clear to me that Tyoga made the free will choice to return to the escarpment to save Tes Qua – the battle with the wolf pack’s Alpha male, Wahaya-Wacon, seems to me to be less of a choice than an intersection of time and place. He chose to return to help his friend, but he did not choose to battle a pack of wolves. That event was based upon an absolute – life or death. Other choices that he makes in the Legend of Tyoga Weathersby are less clear. Why he chose to set Sunlei free to face the perils of the frontier alone, with little more than the admonition to “Run!” still makes me scratch my head. There were infinite choices that he could have made. Similarly, I understand why he butchered the Shawnee braves sent by Yellow Robe to capture him and Sunlei, but he surely could have chosen other ways to make the point . But these are aspects of the book that I purposefully did not reconcile for the reader. It is my hope that readers will question these things and ask how the exercise of free will impacts their own lives, and to what extend are we little more than feathers blowing in the wind. There is a great deal to discuss about The Legend of Tyoga Weathersby. But you knew that it was more than a story about a wolf . . . .didn’t you? H. L. Grandin grew up in the shadow of history near Mt. Vernon, Virginia. As a boy, he spent many hours exploring the hills, valleys and waterways throughout Virginia, which nurtured a deep appreciation for nature and its forces. Those adventures became he inspiration for The Legend of Tyoga Weathersby. For the past 25 years, H. L. has lived on a small farm in western Maryland where he and his wife raised three daughters and a passel of critters.